EARMILK is proud to be able to sponsor the upcoming BUKU Music + Art Project festival. The event takes place on March 8th & 9th and it just so happens to take place in New Orleans, Louisiana. The location is perfect when you consider the elective nature of the event. Not only does the event contain a great mixture of musical genres but it also will consist of artistic expressions in all various forms. Now, when it comes to the genres; the event will be covering hip-hop to electronic and everything in between. The beat scene will have a major presence. 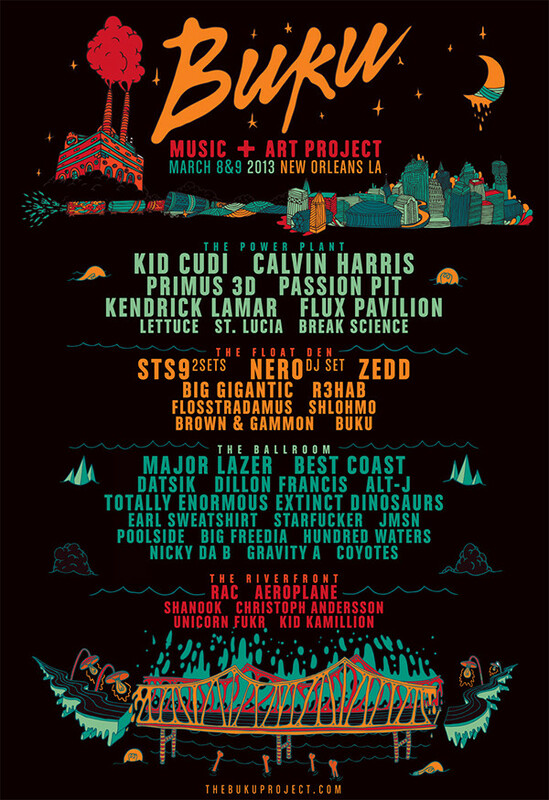 The headlining cast for BUKU 2013 includes Kid Cudi, Calvin Harris, Kendrick Lamar, Flux Pavilion, Nero, Passion Pit, Zedd, Big Freedia, Nicky Da B, Flosstradamus, Earl Sweatshirt and Major Lazer. Last year, the BUKU Project sold over 8,000 tickets and based on just the initial lineup, as well as the addition of a third stage, it’s exciting to think of what’s to come in 2013. Tickets available now!